We accept payments online for items such as dinner money, school trips. 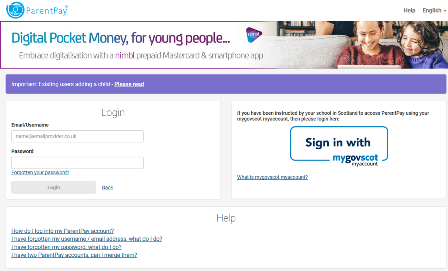 Using a secure website called ParentPay you can pay online using your credit or debit card. ParentPay is our preferred method of making payments to school and ordering school meals. The more parents that use ParentPay, the greater the benefit is to our school. You can help us reduce workloads for all staff, creating more time to lend to educational support and the smooth running of the school. Using ParentPay also ensures that all financial transactions are safe and secure - helping us to remove costs associated with us having to manage cash securely on the school premises.